The most efficient way for someone to earn Iberia Avios is through credit card spending with transferable points. 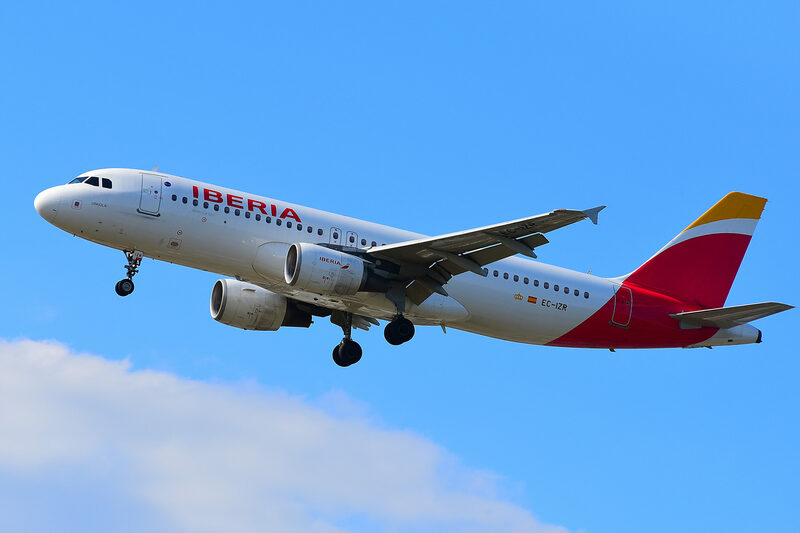 Iberia refers to its airline miles as Avios, so when you see Avios referenced through this post, just know that Avios is the airline currency Iberia uses. Iberia does have an appealing credit card that offers you the ability to earn 3 Avios on purchases with Iberia, British Airways, and Aer Lingus and to earn 1 Avios on all other purchases. However, the earn rates from Amex, Chase, and Marriott will yield a better return over the long run. Chase is the co-branded partner with Iberia on its Iberia Visa Signature® card. This partnership really packs a punch. The Iberia Visa Signature® card earns 3 Avios points for every $1 spent on Iberia, British Airways, Aer Lingus, and LEVEL purchases. For all other purchases, the card earns 1 Avios point for every $1 spent. In order to unlock the larger welcome bonus tiers, a sizable portion of your spend will need to diverted to this card. Given that a sizable spending amount would be needed to maximize your benefits with the Iberia, other card options may be a better fit. American Express allows you to earn Avios via a Membership Rewards points transfer. As an Iberia Plus member, you can reduce the cost of Iberia flights by as much as 50% when booking directly with Iberia using your Avios. A big benefit of being an American Express cardholder is that Amex partners with many valuable airlines, many of which regularly offer bonus miles when transferring Amex points to airline partners. This allows you flexibility when trying to redeem an award flight since you have multiple airlines to choose from. Chase and Amex constantly compete for the top transferable point program spot. Both programs offer both a ton of different credit card products and valuable airline and hotel partners. 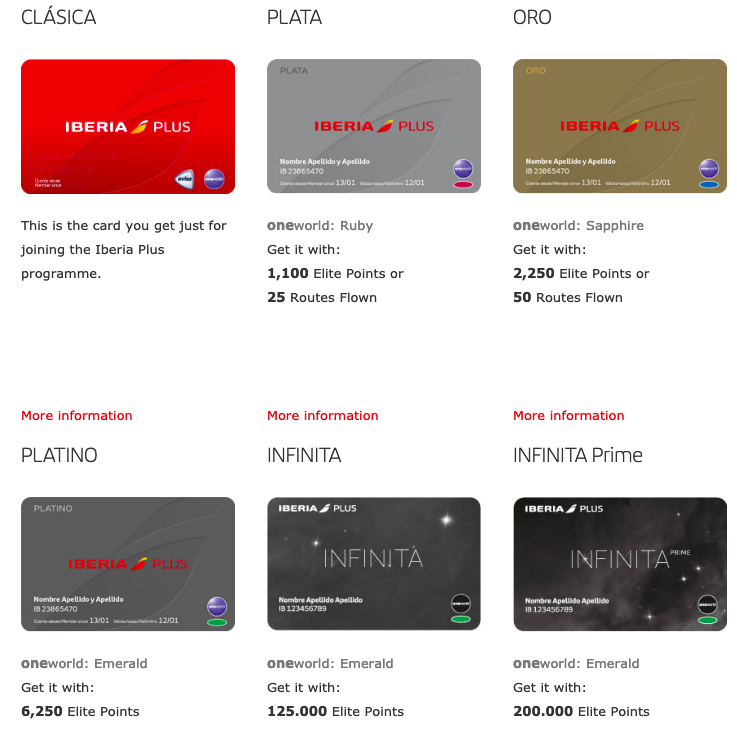 With respect to the Iberia Plus program, Iberia is one of Chase Ultimate Rewards’ airline partners. This means that if you have Chase Ultimate Rewards points, you can transfer those points directly to Iberia. The point transfers are 1:1, so 1 Chase Ultimate Rewards point is equal to 1 Iberia Avios (mile). The reason that this partnership is valuable is because Chase Ultimate Rewards points are much easier to earn versus earning Avios with your Iberia Visa Signature® credit card spend. The Ultimate Rewards program is unique, relative to Amex, in that Hyatt is a hotel partner. As many people know, this partnership leads to receiving a ton of value with Chase points. All in all, Chase is a solid program that rewards members who know the program’s best transfer partners. The Marriott Bonvoy loyalty program has seen quite a few changes recently, so it’s important to stay up-to-date on the latest with the program. Marriott Bonvoy has 40+ airline transfer partners in all, which is staggering compared to Chase and Amex. However, what is important to note and what can be frustrating, not all transfer times are created equal. What this means is that when you transfer Marriott points to one its airline partners, the time it take for the points to leave your Marriott account and show up in your airline loyalty account is not the same. In some cases, the transfer times to airlines are 1 day (Flying Blue). In other case, the transfer times to airlines take 10 days (Asiana Airlines). One benefit of the Marriott Bonvoy program is the bonus structure. For every 60,000 Marriott points that are transferred to an airline partner, you’ll receive a 5,000-point bonus in the form of airline miles. 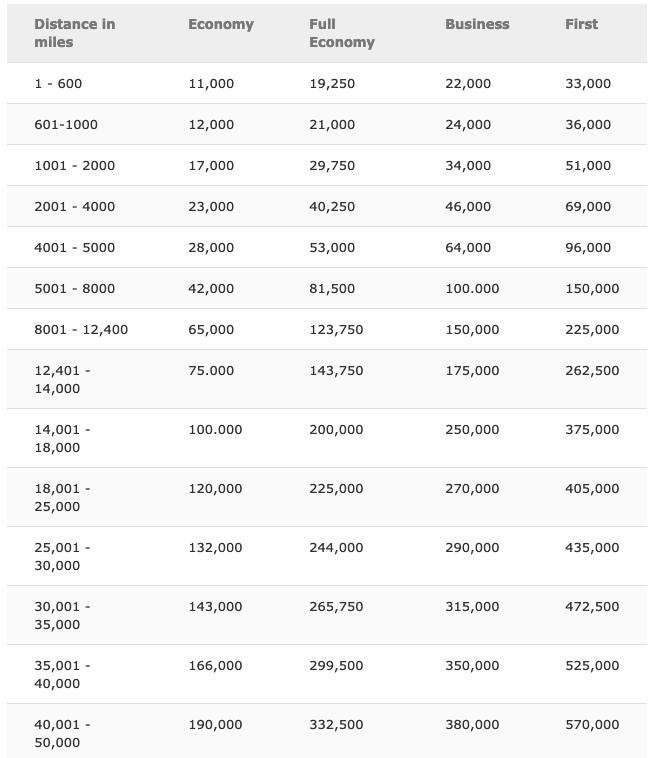 Since most of the Marriott to airline transfer ratios are 3:1, this means that 60,000 Marriott points become 25,000 Avios with the 5,000-point bonus (60,000 / 3 = 20,000 + 5,000 = 25,000). If you’re not a Marriott Bonvoy member, you may be interested in transferring your points from other hotel programs like Hilton Honors and World of Hyatt. Unfortunately, other hotel loyalty programs might not offer as good of a transfer ratio as the one listed above through Marriott. This means that when transferring hotel points into airline miles, you won’t be getting as many miles as you could with other programs or other transfer avenues. We would recommend transferring other hotel program points to Iberia if you’re topping off your Iberia Plus account for an award flight. Otherwise, you’ll find better ways to use your Hilton Honors or World of Hyatt points in other ways. Iberia Airlines is the flagship airline carrier of Spain that operates out of its hub at the Adolfo Suárez Madrid–Barajas airport (MAD). Flyers can book flights out of MAD to destinations across Europe and the world, including a handful of non-stop flights to the United States. The airline is a Oneworld™ alliance member joining the likes of American Airlines and Cathay Pacific. With Iberia’s Oneworld membership, frequent flyers with miles earned on Iberia can redeem them not only for Iberia flights, but also for flights on airlines across the alliance. Iberia Plus is the airline’s frequent flyer program offering its members value when flying Iberia or a Oneworld partner airline flight. Iberia Plus members are awarded elite status based on the number of Elite Points or Routes (segments) flown between April 1 and March 31 of the following year. 2) the distance of the flight on a partner airline. In addition to the Elite Points awarded for flying, members also earn Avios, which can be redeemed for award flights and upgrades. Additionally Avios can be redeemed for hotel stays, car rentals, and experiences. Bottom Line: Iberia is a well-rounded program that U.S. travelers, particularly those with Oneworld status, are able to take advantage of. If you’re interested in joining Iberia Plus, membership is free and you can set up your Iberia Plus account by filling out this application. Iberia Plus members have the ability to earn and redeem Avios in the Iberia Plus frequent flyer program. 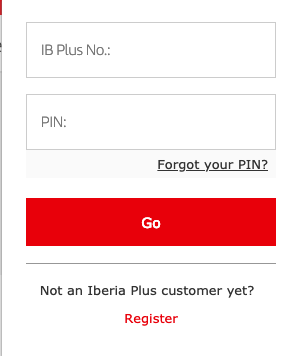 Enter your Iberia Plus Number and Pin that you provided in your application to access your account. Hot Tip: Iberia provides anyone access to its award charts, but you’ll need to login to your account to search for award space. If no account activity exists for 36 months, the Avios will expire. There are three elite tiers in the Iberia Plus frequent flyer program. Members who move to higher elite tiers unlock additional benefits such as lounge access, higher mileage earn rates, and fast-track security status. Oneworld status (Ruby, Sapphire, Emerald) is a separate status in addition to your Iberia elite status. With Oneworld status, members will be have a number of benefits such as Oneworld lounge access, priority check-in, and fast track at select security lanes when flying on a Oneworld Alliance member flight. A full list of program benefits can be found on the Iberia Plus program page. Bottom Line: Iberia has unique elite benefits for its members, in particular, for those who earn Platinum status. 100% bonus Avios, two Iberia Business Class upgrades, limo transfers, a 22,500 Avios credit, and Iberia VIP Lounge access are all valuable perks at the highest Iberia Plus elite tier. Gold has a couple of benefits to evaluate, but it’s most important to ask yourself if the benefits offered at each elite tier are valuable to you. If you decide to earn elite status, try to earn Platinum as the benefits at this level give you the most in returned value. Bottom Line: Bonus Avios, upgrades, bonus Avios, and Iberia VIP lounge access are the benefits to expect if you are able to earn elite status in the Iberia Plus program. Iberia elite status is earned by the number of routes (segments) flown or the number of Elite Points earned. The number of Elite Points earned is driven by the route when flying on Iberia or the distance flown when flying a partner airline. Platinum status is shown as 6,250 Elite Points, but in reality, a member needs 12,500 to qualify. Each subsequent year would require 6,250 Elite Points. Unlike other programs, unfortunately, you’re not able to earn Iberia Plus Elite Points through Amex, Chase, or Marriott credit card spend. Bottom Line: The only way to obtain Iberia elite status is to fly on Iberia Airlines or on partner airline flight. By partnering with Amex, Chase, and Marriott, Iberia Plus members have more than one way to earn Avios. While members can transfer points from these programs directly to Iberia Plus, it’s important to note that Chase is the only partner where the point transfer is instant. Amex and Marriott are not instant, 6 days in the case of Marriott, so keep that in mind when planning your award redemption. Flying Iberia Airlines or another partner airline is straightforward when it comes to earning Avios. The number of Avios you earn depends on the flight distance and the class of the ticket that you book. 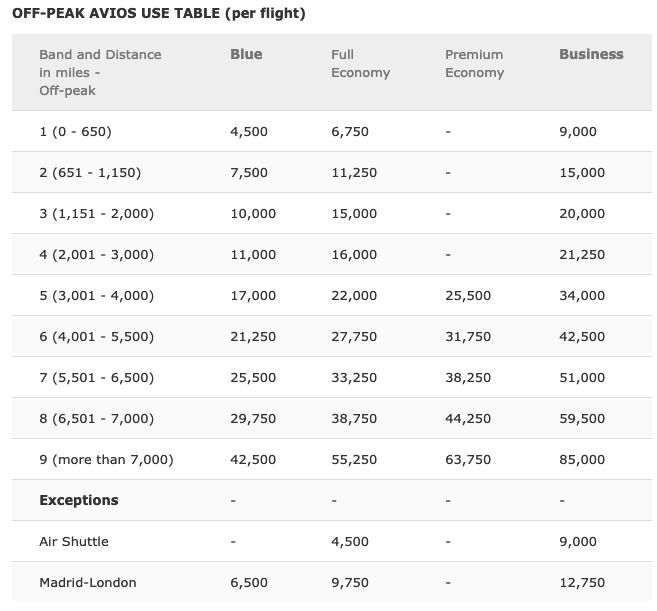 Iberia has a full list of earning rates to determine that amount of Avios earned with each partner airline. Elite status members also earn bonus Avios. The amount of bonus Avios is determined by multiplying the bonus percentage by the flight distance or a 500-mile minimum for short flights. Oneworld member airlines. Image courtesy of oneworld.com. For partner airline flights, make sure the partner flight is an Iberia-marketed flight or you will not earn Iberia Avios. All of the partner accrual rates can be found on the partner airline page. In addition to the Oneworld alliance, Iberia has separate partnerships with Vueling, Level, Interjet, Royal Air Maroc, AirItaly, Binter, and Avianca. Head to the partner airline page to see the full list of Iberia’s partnerships. Iberia’s partnerships with Amex, Chase, and Marriott provide a number of ways to earn Avios with your credit card spend. With Amex and Chase, evaluate all of the personal and business credit cards that earn Membership Rewards and Ultimate Rewards points respectively. If you sign up for Marriott credit cards, remember that you’ll receive a 5,000-mile bonus for every 60,000 points transferred to an airline partner like Iberia. Avios can be earned in other ways to that do not involve flying or credit card spend. Check out the Iberia Facebook, Twitter, and discount vouchers page for additional places to earn Iberia Avios. Lastly, car rental and hotel partners have opportunities for members to earn Avios with every rental and hotel stay. Hot Tip: If you add your airline loyalty program to other services, you typically won’t also earn status points with these franchises. For example, this partnership acts as a sort of alliance between the airline and car rental agency. Redeeming Iberia Avios for award flights yields the best value, but as is the case with most airlines there are many ways to redeem Avios. Iberia is unique in that the airline offers peak and off-peak pricing, so take advantage of the lower mileage dates. Off-peak dates include the 2nd half of January, all of February, 28 days in March, half of April, 29 days in May, half of June, half of September, 29 days of October, 26 days of November, and 12 days of December. The number of Avios required is determined by the distance, fare class, and date of the flight. With a handle on the Iberia award chart, check out what Iberia partner airline charts have to offer. As previously noted, each airline has its own award chart when you are using Iberia Avios to fly on that airline. 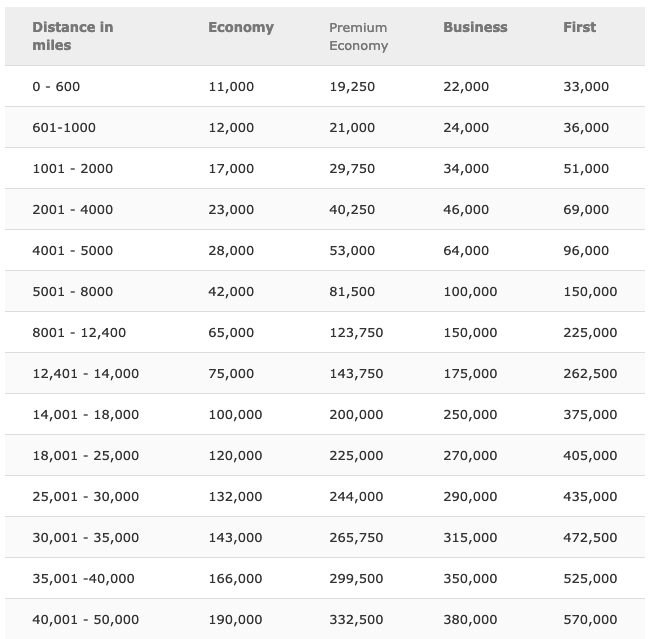 For example, the American Airlines award chart shown below is the award chart that you’ll reference when you are using Iberia Avios to fly on an American Airlines flight. You can fly on an American Airlines flight using Iberia Avios because American Airlines and Iberia are airline partners. Another Iberia airline partner is Royal Air Maroc. The Royal Air Maroc award chart is shown below. If you are looking to fly on a Royal Air Maroc flight, you will reference the chart below. The reason that you can fly on a Royal Air Maroc flight using your Iberia Avios is because Royal Air Maroc and Iberia are airline partners. Diving deeper into the redemption side, let’s look at a couple of sweet spots. A sweet spot means that the number of Avios required for the referenced flight is likely the lowest number of miles required to fly when compared to all of your other point redemption options. Hot Tip: We have an entire post on the best ways to redeem Iberia Avios if you’re interested in seeing all of the redemption opportunities with Iberia Avios. Determining the amount of Avios required for Oneworld and partner airline flights is easy with Iberia Airlines since all of its award charts in the same place. Save this partner airline page to use as a reference guide when booking Iberia partner flights using Avios. For Oneworld partner flights, use British Airways and Qantas to search for award availability. Neither site is perfect, but a combination of the two will ensure you can see the award space you’re looking for. Iberia shows award flights for some partners, like American Airlines, but not all partners like Royal Air Maroc. If an award seat on a partner award flight isn’t shown, you’ll have to search for space elsewhere and call Iberia at 800-772-4642 to book the flight. Hot Tip: Use Expert Flyer if the Iberia website will not show award space for the flight you are looking to book. What is the Iberia Plus program? Is it worth it? What are the benefits? Iberia Plus is the frequent flyer program of Iberia Airlines. It’s free to join and allows members to earn Avios and elite status, as well as use Avios for an award flight. Iberia Plus members are awarded elite status based on the number of Elite Points or Routes flown between April 1 and March 31 of the following year. Joining airlines like British Airways and Japan Airlines, Iberia is a Oneworld alliance member. Iberia’s Oneworld membership means that Iberia Avios can be used to fly not only on Iberia, but on partner airline flights as well. What other programs partner with Iberia Plus? Can I transfer Avios to them? Iberia Plus provides members with an opportunity to earn Avios in a variety of ways. Car rentals, credit card spending, and hotels are the ways to earn Iberia Avios that do not involve flying. Award flights, hotels, car rentals, and experiences are available for members looking to redeem Avios. While transferring Iberia Avios to an airline partner is not allowed, members can redeem Avios for Iberia or partner airline flights. What this means is that you can’t transfer your Iberia Avios to an airline partner like American Airlines. No airline will allow you to transfer its own airline miles to another airline. You must use those airline miles (i.e. Iberia Avios) only with that airline. However, you can use your Iberia Avios to book an Iberia flight or a partner airline flight like American Airlines. What is the Iberia Plus login? Head to this page to login to your Iberia Plus account. Where can I sign up for Iberia Plus? Check out the application page to sign up for a free Iberia Plus account. What is my Iberia Plus number? You can find your Iberia Plus number by signing into your account, looking on your membership card, or through a variety of marketing emails they send you. 8:00- 24:00 Lt. 7 days a week. When do Avios post in my Iberia Plus account? Iberia Avios should post in your account within 7 days after your date of travel. When do Iberia Plus Avios expire? When does Iberia Plus status expire? Silver and Gold status are valid for 12 months. Platinum status is valid for 24 months when the member accrues 6,250 Elite Points. Is there a Iberia credit card? Can you hold an award flight with Iberia? Unfortunately, Iberia Airlines doesn’t allow Iberia Plus members to put a hold on an award ticket.